Mashed potatoes are my guilty pleasure. I've flavored them in the past with garlic, pesto, plaintains, olives and purple sweet potatoes, just to name a few. This time, I used broccoli. It complements the flavor and gives a beautiful color to the purée. My favorite way to make this dish is to simply mash them using a potato masher, then add milk, cream and lots of butter. 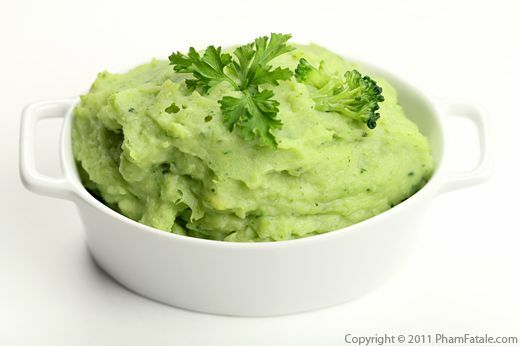 It might not be the healthiest approach, but it's certainly the most delicious for creamy mashed potatoes! This recipe is an easy take on baked yams. The yams are boiled first, then filled with a little butter and maple syrup. 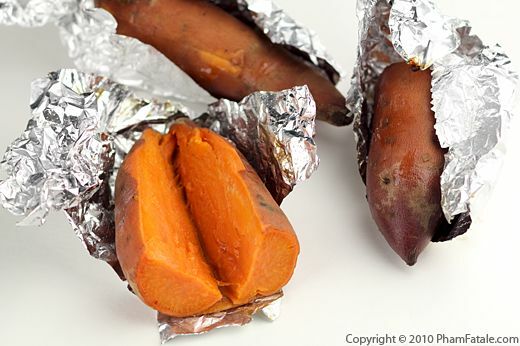 After the yams are individually wrapped in foil, they are baked until caramelized and juicy. You can eat them plain, with brown sugar-flavored butter, salt and pepper or a sprinkle of toasted sliced almonds. Yams are a staple on everyone’s Thanksgiving menu, but not everyone likes the sweetness of candied yams. This is a great alternative that is much more savory. 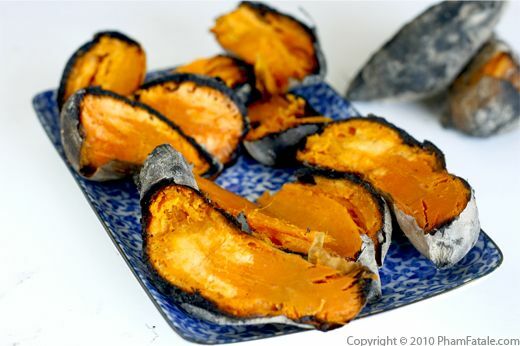 An added bonus is that the yams can be prepared in advance in the morning and warmed just before serving (in the microwave or in a steamer). If you do as much cooking as I do on Thanksgiving, that alone is reason to consider this dish. As promised, here is the recipe for carrot purée that I served with my tapenade chicken the other day. I flavored the dish with rosemary, mustard, cumin and almond butter. The almond butter both thickens the purée and provides a nutty flavor. It's a lighter, healthier version of the creamy mashed potatoes we served for Thanksgiving. 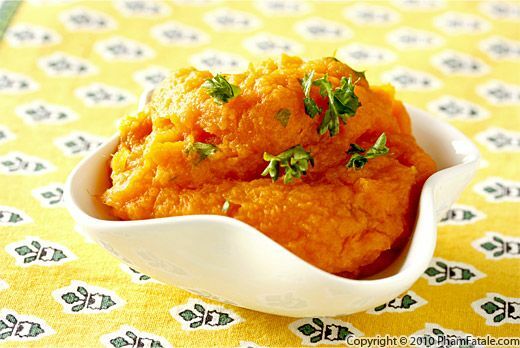 Sweet potatoes and carrots are a great source of vitamin A and potassium. But don't get me wrong, healthier doesn't mean less flavorful. If you've read my many of my past recipes, you know that I'm not shy about using full fat ingredients. In this particular dish, I just don't think it's necessary to get that unctuous, creamy mouth-feel. Using the cooking techniques in the recipe, you'll be able to convince even the most anti-health food person in your life that the dish is loaded with heavy cream and butter. 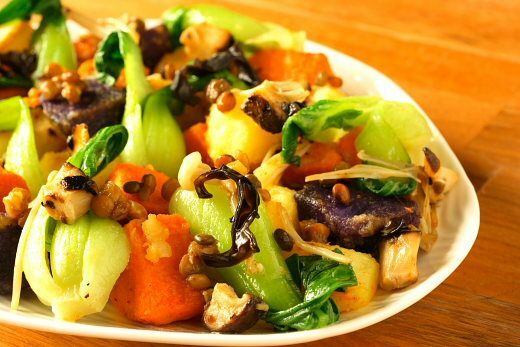 This potato salad is made with a medley of Japanese white sweet potatoes, yams, Yukons and Peruvian purples. The different varieties provide a contrast of both flavor and color. To give the salad an Asian flair, I also added bok choy and several types of mushrooms. The dressing, made of honey, rice vinegar, soy sauce and ginger paste, helps tie the flavors of the vegetables together.